Curious to see what we are all about? 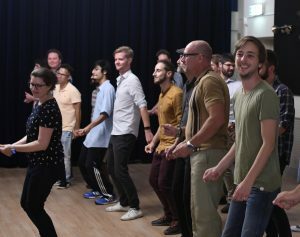 Come by Fanfarezaal Sint Servatius at 20:00 each week for social dancing – free and open to all! The bar is open and we’ll keep the music playing. This 8-week course teaches you the basics of the Lindy Hop! It is designed for total beginners so anyone is welcome to join! The Lindy Hop is a partnered dance that originated from the African-American community in Harlem, New York in the 1920’s/30s. It is a lively energetic dance that responded to the type of big band jazz music at the time. Registering with a partner is not required, because we rotate partners throughout the class, but doing so increases the likelihood that you will be able to join the class. We will put individual registrations on a waitlist and process them as soon as someone in the opposite role registers. Once we have confirmed availability and processed your registration, we will contact you about payment details by email. This course for advancing your dancing – Cengiz and Julia will fuel your Swing dancing in 4 weeks! Please note: this is not a next level beginners course as you should have participated in several courses, and maybe you even visited a workshop. Also, the content of this course is different from previous Improvers courses. We will work on building up your repertoire of movement and figures, musicality and improvisation. We will also introduce you to partnered Charleston and show you how to mix it up with your Lindy Hop! Come and improve your dancing!